FREDERICK Lee Brooke could be creating a new literary sub-genre – the relationship thriller. Like all good thrillers, Collateral Damage crackles along at a merry pace while the reader eagerly awaits the denouement of Annie Ogden’s entanglements with three men. Ex school teacher/ Iraq War veteran/ part time private eye Annie is engaged to her tubby partner in crime solution Salvatore. 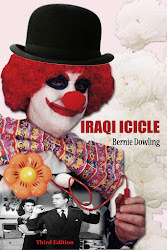 But her former lover in Iraq Michael bobs up Stateside to stir residual amorous feelings. Michael’s eccentric behaviour is still attractive though his recent addiction to methamphetamine is not so much. When the first dead body hits the page, Michael is banged up as chief suspect and Annie is determined to get him out of jail which displeases fiancé Salvatore more than a smidgin. Michael, of course, cannot do much sleuthing but Annie and her ex-army buddy June can and do. Salvatore and Todd, also team up in a hostile partnership to see who the killer is and who gets the girl. If you told me the plotline of Collateral Damage, I would have provably said “pass” as in “pass me a neo-noir”. But I read the book in three sittings and I turned the pages eagerly. Characters are believable and well-drawn. Pacing is executed with precision and there are some deft touches as when a distraught Salvatore seeks comfort in food. And I did want to know who gets the girl as much as the who and whys of the central mystery. There is a fair bit of business about food and drink in the novel but everyone likes eating and imbibing. I am not a big fan of prodigious questions in a thriller which seem designed to help the slower reader keep up. They are plenty of plot recaps here but for the most part they are fairly unobtrusive. Author Brooke is clever in not overstating the serious theme in the book of problems of war veterans in adjusting in civil society. The message comes across finely with subtle handling of the topic. I know almost zero about the romance genre, but I imagine some of its fans might jauntily cross over to this thriller. If you are a fan of romance, mystery and thrillers you may well have hit your literary jackpot here. 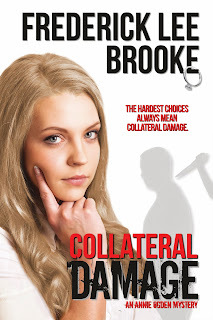 I believe Collateral Damage is the third in the Annie-Ogden series. I feel confident reception will be positive enough to encourage a fourth. 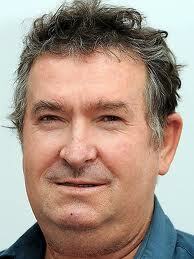 Here is out song tribute, a lovely singer, no blonde hair, though. You have to read the book to get my in-joke. Sorry. This is a fantastic review, Bernie! I think you nailed the genre description too--I know a lot of bloggers have been struggling to place it. Thank you for taking part in this tour and for cross-posting your review to Amazon and GoodReads when you have the time. Don't forget to enter the Rafflecopter and random commenter contests, too!